A Staveley company colliery named after one of the company directors which was the norm for them, situated near to Woodthorpe village to exploit the Top Hard seam for machine and steam coal. The sinking of the shafts was started in 1855 and the colliery went into production three years later in 1858. The colliery was capable of producing 700 tons of lucrative locomotive coal for the railway companies daily as it did frequently during the 1860's. 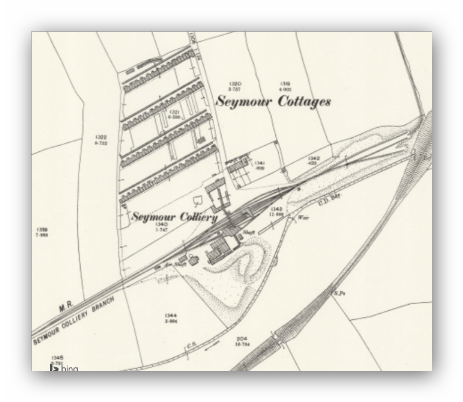 The company built the Seymour Cottages to house the colliery workforce and their families the houses were in four parallel terrace rows of brick construction consisting of over 100 houses with each house having its own outbuildings with earth middens and allotment gardens. The houses had one main room downstairs and two bedrooms upstairs. There was a row of three houses at the bottom to house the colliery officials known for obvious reasons as 'gaffers row' and a further bottom row of workshop buildings was built to serve the colliery. 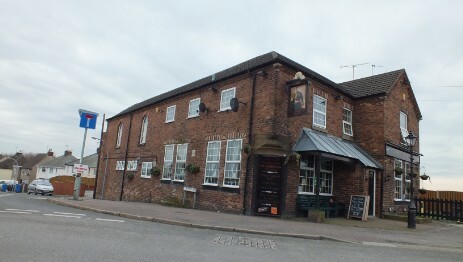 The company may have built Woodthorpe school and the Albert Inn for the education and refreshment of the workforce as they do not appear on the scene until the era of the colliery, a small chapel was built to the right of the terraces at the side of the road. According to the T.P. Woods Almanac the colliery housing was demolished on April 15th. 1932 from a closure order as being unfit for human habitation served by the council in 1929 despite attempts being made to modernise some of the houses. The colliery closed around 1919 with men being transferred to other local company mines at Oxcroft, Ireland, Hartington and Markham. The site of the colliery wasl in use as a coal transportation depot for R.J.Budge mining. Then it was left derelict with no rail services and finally it is being landscaped to house the extension of the Markham Vale development. In 1896 the colliery is mining the Top Hard seam producing Machine and Steam coal with 523 men employed underground and 85 on the surface. The manager was S.B.Gilroy with under-manager R.S. Knight. Derbyshire Times. June 8th. 1872. Wanted at Seymour colliery a Pick Sharpener. Liberal wages given to a steady man. The area was surveyed in 1837 for a 'proposed' colliery which included a 'proposed' railway link from the colliery running north to the 'proposed' Midland Railway running west to east through Staveley. 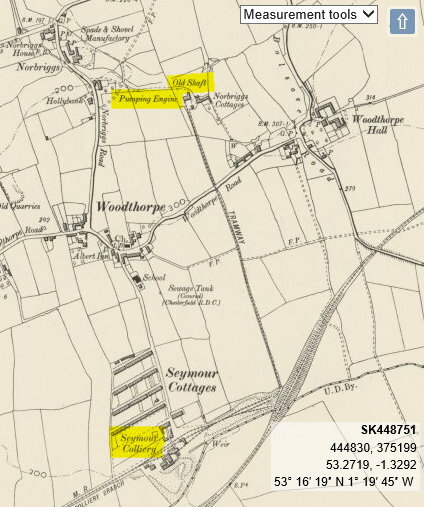 The colliery had one main shaft in the pit complex with another shaft fed by a surface tub track to the north east of the colliery and over the Woodthorpe Road in the fields behind the church. Derbyshire Times 6th July 1918. 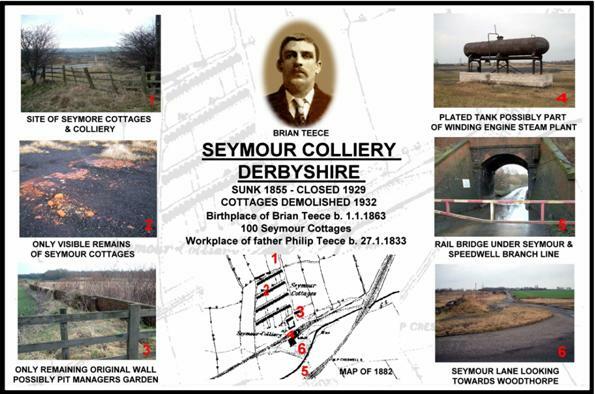 After 50 years the Seymour Colliery Staveley belonging to the Staveley Coal and Iron Company LTD. was closed on Tuesday. The pit was sunk some fifty years ago and has, therefore had a remarkably good working life. The seam worked has been the Top Hard a particularly good house coal. 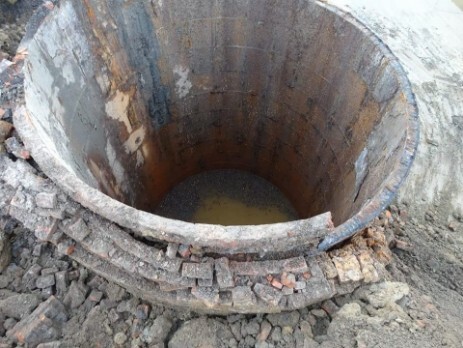 The reason for the closure is that the pit is practically worked out but happily few if any of the men would be adversely affected by it as the company is finding work for them at their other collieries. 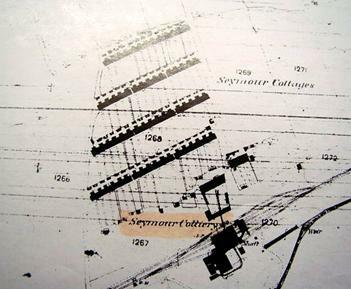 The output at Seymour has varied during its career and at one time 1,100 tons a day were turned there. That was a time when a large number of men were engaged there and before it was worked out so fast. The number of miners at Seymour recently have been about 52 and with the surface workers the employees totalled about 90. The four photographs showing shaft capping operations are copyright 2016 Miles Prentice. Many thanks to him for allowing me to use them. From the two maps above: left 1900 (25 inches to the mile) and right 1937-1961 (1 to 25,000) it would appear that two small blocks of houses were left standing after the official demolition and into the 1960's. Maps National Museum of Scotland. So the demolition order was not carried out to the letter and as mentioned below people continued to live in the village for a short while after the date specified. I refer to your article on your website concerning the housing at Seymour colliery. You state that houses were demolished in 1932 this cannot be. 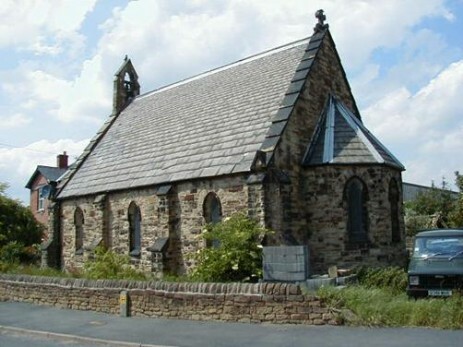 I was born at Woodthorpe in 1948 and attended the local school in the early 1950s. I had two class mates who lived in Seymour cottages and visited their house, they lived in the top row. I have all so discussed this with a friend of mine who Attended Netherthorpe grammar school in the mid 1950s. He can remember going on cross country run round Seymour and seeing the cottages. The reference to the houses is from the Derbyshire Times via T.P. Woods Almanac. I will check the reference and send you a copy and also include your comments on that web page. 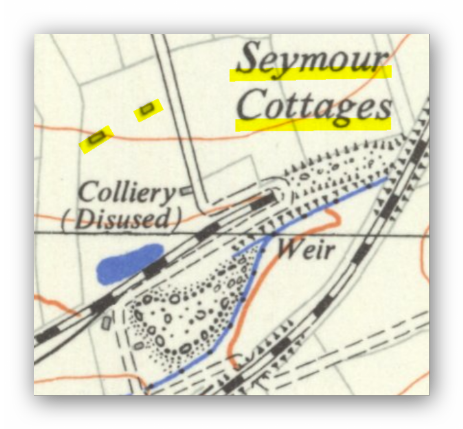 Thank you for your reply, I also forgot to mention my great grandad moved from Shropshire to Work at Seymour colliery round about 1850, they lived at number 20 Seymour cottages. My grandad also lived there and my dad was born there in 1918. I have included a copy of the short article from TP Woods Almanac 1958, it is covered in many other editions too. The only comment I can add is that the demolition was only on the workers housing, the row of three cottages belonging to the management could have been left as they were of a better construction. I will take onboard your comments and add them to the web page on Seymour and see if anything surfaces. I have managed to get hold of my old school pal Richard Collins. He says there were six houses remaining a block of three, a pair and one on it's own they were all in a line. The first house was occupied by the Vaughan's then Barnards, Edwards, Collins (my pal), Dericots then lastly the Denman's. Hope this may be of some help for you. I too have been seeking photographs of Seymour and as yet I have not seen any at all. I keep searching. A personal comment from Isabel Pope. I lived in a four bed-roomed Seymour Cottage in 1953-1959 with my husbands family; the Denmans. The road was unmade, there was only one row of cottages, we had water, main drainage but no electricity. 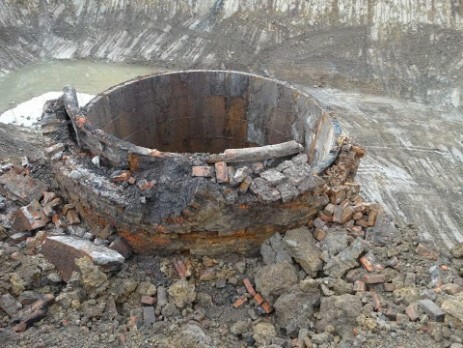 The property was completely surrounded by colliery waste, may be this was the reason the property was demolished. Isabel Pope. June 2017. (Many Thanks). 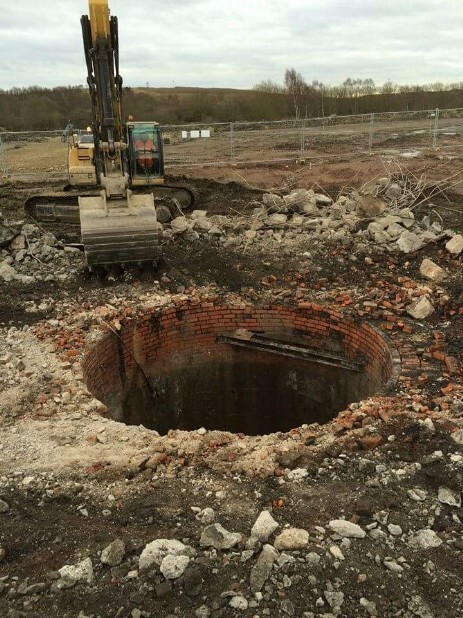 Top set of photographs coal reclamation of the old colliery and stockyard site 2015. 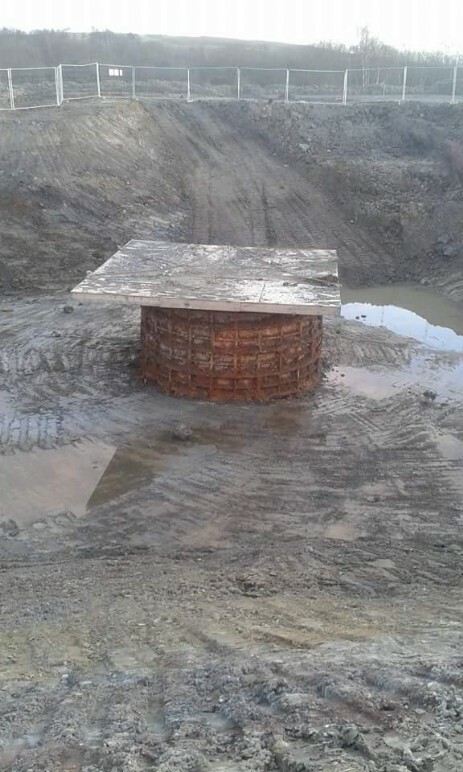 Bottom set of photographs February 2016 as the site is developed fro the Markham Vale extension.